Sen. Marco Rubio is one of three major G.O.P. candidates out of Florida (along with Jeb Bush and Mike Huckabee). This should provide him with a general election advantage of providing a strong showing in this important swing state. 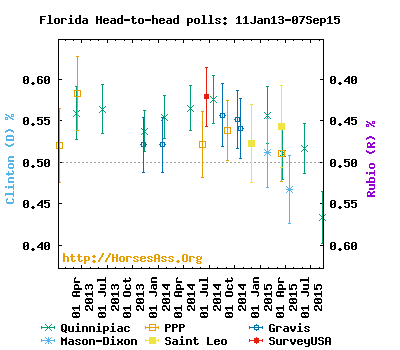 The most recent Florida poll, taken in the second week of August, has Rubio leading Hillary Clinton by +12. So how is it that Clinton can be behind in these three swing states and still lead? It’s because she leads in Wisconsin (+12), Virginia (+1), Texas (+1), Louisiana (+3) and Georgia (+3). Virginia is the only state with a recent poll. Of states with older polls, Wisconsin is at least plausible, but Texas, Louisiana and Georgia seem unlikely to swing blue in 2016. 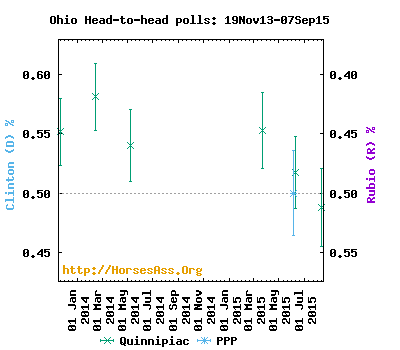 Clearly, much more polling is needed to get a feel for where the race is at. 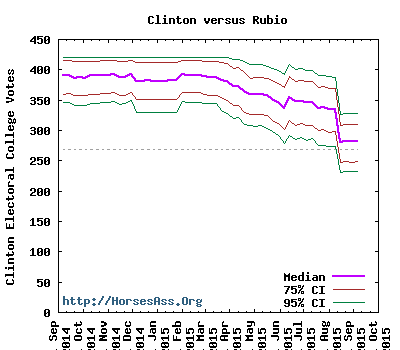 Clinton has certainly lost ground over the summer, and this is probably a function of two things. First, voters are familiarizing themselves with, and getting used to the idea of voting for Marco Rubio. Second, Clinton has had a terrible summer from the perspective of national popularity. For most of the summer, what news we’ve heard about Clinton, has been largely negative. The Clinton campaign has been disconnected from a general election audience, as her campaign focuses on another important aspect of the race. They have spent the summer quietly locking up superdelegates, almost guaranteeing her the Democratic nomination. The trade-off for a lousy summer is that the campaign will be freed up early to focus on the care and feeding of general election voters while the Republicans bludgeon their way through an unappealing primary. Republicans have a very different nomination structure, they don’t have superdelegates, and the dynamics of their over-populated primary are entirely different, so that campaigns have spent the summer attempting to maximize positive news cycles (or, in the case of Donald Trump, positive or negative news cycles). This has allowed the top contenders to “catch-up” to Clinton and, given some more recent polling, possibly top her. For the polling we have now, however, Clinton holds a thin lead. After 100,000 simulated elections, Clinton won 64,668 and Rubio won 35,332 times (including the 1,511 ties). 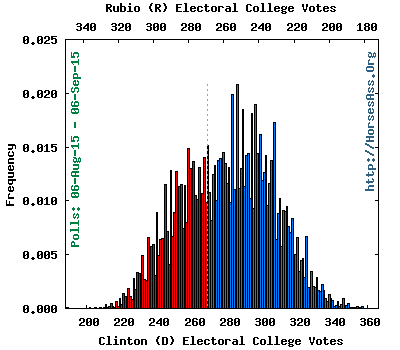 Clinton received (on average) 280 to Rubio’s 258 electoral votes. In an election held now, Clinton would have a 64.7% probability of winning and Rubio would have a 35.3% probability of winning. Clinton wins 64.7%, Rubio wins 35.3%. 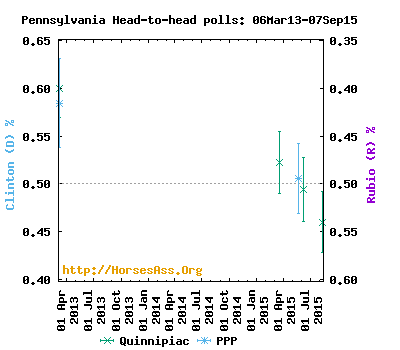 The long term trends in this race can be seen from a series of elections simulated every seven days using polls from 06 Sep 2014 to 06 Sep 2015, and including polls from the preceding 1month (FAQ). I agree with Jack, (hint: Bernie Sanders). Sorry…there are head-to-head polls that match up Sanders with one of the G.O.P. candidates in ten or fewer states (depending on the match-up). That simply is not sufficient to do a serious analysis. I’ll include Sanders analyses should we get enough polls to make the analyses worthwhile. I wouldn’t vote for Bernie Sanders if he were giving away free Ben & Jerry’s ice cream, but the guy is about the most honest candidate that’s currently in the race for prez in 2016. At least we all know exactly where Bernie stands on all of the issues, and he means it sincerely. @4 I probably wouldn’t vote for anybody you’d vote for, which makes me a more reputable citizen than you even though I’m only a rabbit. @1 & @2: The problem with you guys’ (and others’) wishful thinking is that while Bernie is campaigning and winning applause, Hillary is locking up superdelegates, which is why Biden won’t enter the race.